Does your NetApp monitoring tool deliver visibility into what’s happening on your NetApp filers? The free edition of Netwrix Auditor for NetApp helps you harden your data security by keeping you informed about user activity on your NetApp filers. This NetApp monitoring tool collects event logs produced by audited systems, analyzes them and presents the collected information in a human-readable format. The daily activity summaries detail all data access attempts and all changes to permissions, files and folders, including the before and after values. Shows which files, folders, shares and permissions were added, modified or removed, with the before and after values. Reports on attempts to access files, folders and shares and indicates whether each attempt was successful. Accumulates data from various sources and sends daily email summaries on modifications and access events on your NetApp filers. Composes meaningful reports that minimize the need to run manual scripts. Complements your NetApp storage performance and storage monitoring solutions at no additional cost. Keeping track of data access attempts and changes to permissions, files and folders on NetApp filers using native tools takes a lot of resources and time. The free edition of Netwrix Auditor for NetApp will make your security monitoring routine far more efficient and effective. Plus, the free software works on all the latest versions of the clustered Data ONTAP operating system, including both cluster-mode and 7-mode. Lack of visibility into your NetApp filers increases your vulnerability to both external and internal security threats. 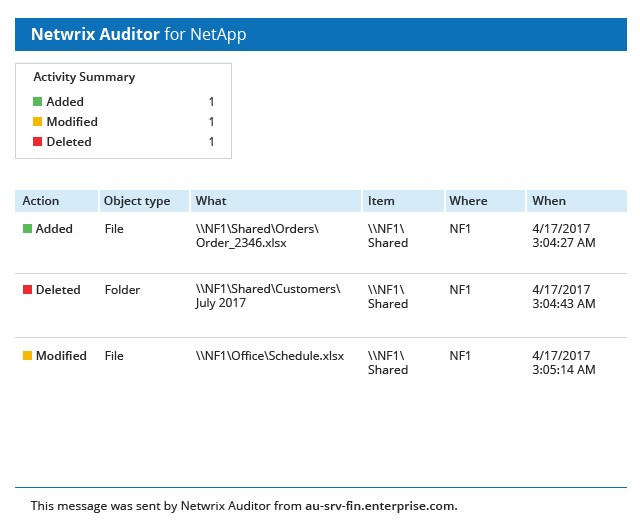 The free edition of Netwrix Auditor for NetApp continuously tracks all modifications and data reads on NetApp filers and sends you daily reports so you can detect any suspicious activity in a timely manner. In conjunction with other tools, it will significantly simplify NetApp monitoring tasks and save you time that you would otherwise have to spend crawling through log data to piece together information about user activity. When you start using Netwrix Auditor for NetApp, you get full functionality for free for 20 days. After that, you can either activate the Free Community Edition or apply a commercial license. The table below highlights the differences between our free NetApp monitoring tool and the standard edition of Netwrix Auditor. "I am very happy with my decision to go with Netwrix, and I would recommend them to anyone. Their software does exactly what it says on the tin." Technical Services Manager, Eclipse Group Solutions Ltd.
Netwrix Auditor for NetApp is easy to deploy and manage. Check out the table below to see if your IT infrastructure meets the minimum system requirements.